These changes will deepen the water crisis in the south-west where the largest part of the population lives. Furthermore, this will lead to a change in food production which will be felt in all the regions. The government’s response has been very weak, both in terms of necessities and in relation to the wider scope of what can be done. We have laws and projects but none are effectively prioritised and few resources are dedicated to ensuring they are implemented. The most well-known are the ones related to reducing deforestation in the Amazon, but this is less than we can and should be doing. For Caritas and other groups active in ecology who are brought together by the National Forum on Climate Change and Social Justice not enough is being done. For example, if there was more political will would it be possible to replace all the energy produced by fossil and nuclear fuel with solar energy produced by panels on the roofs of houses in all regions in something like five years’ time? This hasn’t been prioritised and it appears that we will put more effort into hydroelectric energy produced in the Amazon. This has a socio-environmental impact and furthers deforestation while making progress in the capitalist sense which isn’t progress at all. We’ll continue using more and more fossil fuels and drilling for oil. 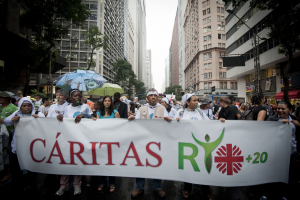 Caritas Brazil works in different ways in different regions on climate change. In the northeast it leads the fight for living with the semi-arid region with water projects, agro-ecology and by promoting fair trade. In other regions Caritas Brazil supports well rehabilitation and reforestation. It also participates in the National Forum on Climate Change and Social Justice where it works with other groups and movements on environmental issues. REPAM is a pastoral network and is related to ecological initiatives which exist in Pan-Amazonia. Its mission is to recognise and support what churches are doing. Furthermore, it encourages communities, parishes and dioceses to adopt a pastoral vision that involves caring for biodiversity and the whole of the Amazon on behalf of humanity as part of its Christian experience. It exercises on a practical level what Pope Francis inspires us to do with his words in Laudato Si’, On the Care of our Common Home. For Christians, caring for creation is part of their faith in Jesus and it’s a way of living their faith. In this way, REPAM joyfully recognises and supports the fight of indigenous peoples in defence of the Amazon and promotes ways communities of traditional people can live in harmony with their environment. To be realistic I don’t have illusions about the COP21 climate meeting in Paris. I believe that the United Nations hasn’t taken the decision that could be the beginning of a new stage in these global meetings – that is to prohibit the physical and political presence of big business which is responsible for exploitation-based development relating to nature and people and who are for this reason the main causes of what is provoking global warming and climate change. I hope that countries are capable of adopting the means to tackle global warming and that they establish a framework for monitoring these methods so that they can be reached. Other countries in South America face particular challenges related to the melting of the Andes ice-caps. Those who depend on these waters for their food, such as in Peru and in Bolivia, will start to have more problems. Having said this, everyone will suffer because of the destruction of the Amazon.